In November, the fine folks at Jalopnik released several illustrations of the 2014 Chevy Corvette. And while those shots were met with a mixed bag of sentiment, the Jalops confidently stated that they were “highly accurate”. Then there was the supplier video showing the C7’s nose (which we were asked to take down) followed by a video rendering of the 2014 Vette. Today, Jalopnik released the rendering of the C7 you see here. The vehicle pictured here clearly carries more “exotic” style and dare we say “European flare” than the current C6 model — and it bears significant resemblance to Jalopnik’s original drawings from November; Jalops says that it believes that this is how the base or the Grand Sport trim will look like when it comes out — most likely at the Detroit (ahem, North American International) Auto Show this coming January. But say, does the ground clearance of this here illustration seem a little too high? We’d love to know what you think of this photo in the comments area below. I love it!!! It breaks from the past but doesn’t look like anything else. It’s best to hold your judgement on these curve mobiles until you see one in person because they don’t translate to two dimensions very well. But that’s a hot shape! I’m sorry but i liked the first one better. This thing, based strictly on the renderings I’ve seen so far, I don’t think I’m going to like at all. I’ll leave it at that. Its about the interior. If it is aceptable its a go. NO! the front end is just like every other exotic! too much euro influence not very destinct!…..
besides that from the fender scoops back is AMAZING love the Camaro influence in the rear! Chin spoiler too low/long. Doesn’t meet the driveway angle spec! I was just looking at some of the spy shots and from that I think Jalopnik’s renderings are pretty close to the mark on this one. That said, Im still struggling with whether I like the looks of this rendering or not. Part of it for me, and I’m sure its the same for the traditionalists, is that its a bit of a departure from previous ‘vettes. It all depends on how its executed. I am a bit of a fan of the Camaro-esque tail lights and rear glass though. I think the Vette needs to bring in more subtle cues from other current and future Chevy products. It is a Chevy after all. Either way, I’m sitting back and waiting to see what the finished product looks like before I say whether I love it like or loathe it, I mean, the rendering might, afterall make it look like a 4×4, am I right? Perhaps it has an adjustable suspension like the Tesla Model S. Makes sense to lower at speed to avoid rubbing the airdam and bottom of car on speed bumps and curbs. Better mileage and higher speeds would result. I will reserve final judgement until I actually see it at the Detroit show. But based on this rendering (and all the others), there isn’t much here to make me want to sell my C6 Z06. I believe the Corvette should set the design influence for other Chevrolets, not the other way around. I don’t want my Corvette to have Camaro taillights, back window, or rear quarters. Right now, I would say the Corvette design team needs to get working on the C8 in a hurry, because the stuff we’re seeing (so far) of the C7 doesn’t cut it! I will wait until I see it in person to really make up my mind but overall I think I might like it. The only part I am not keen on is the nose being so…stretched? Low? Not sure what but something there does not look quite right. I would have to redo my driveway again! But for sure, 2D never looks as good as the real thing so who knows, maybe it is completely awesome in person! I may have to take a trip in January!! I hate it,it’s european once more and this is just an rendering. The shape is wrong,sides are bad. I like the shape…Pratt & Miller will improve it for the C7.R…but this time, the interior is the thing ! I hope they lose the Camaro tail lights though, Camaro should take styling clues from the ‘Vette NOT the other way round ! When I saw the Ferrari F12 on the cover of AutoWeek, it did give me some hope that the C7 might look similar. It’s well known that previous Corvette designs have had Ferrari influences… So maybe the C7 will look better than what we’ve seen so far! Yes, I agree. The Corvette should look more like a Ferrari because that is one of its competitors. The rear side profile has a little Daytona in it too! Yet, it still looks unique to me. The 84 Vette was a huge departure from “tradition” but people loved it; I think this one will be the same. One thing to remember is they are not screwing it up like the next Mustang. It will have blinding performance, it won’t be smaller/downsized or anything like that. Isn’t it time to have a concept car released? That’s very interesting and very handsome. But I guess only time will tell the truth. Regardless of what the final styling design is GM should offer an ultrasonic parking detector or a camera for the front. God only knows how many times I’ve almost killed my Camaro’s front spoiler trying to park it..
the C6…The chrome highlighted gill is a Saturn take-off……I’m still hoping this is not the final product. You will have to see it in person to evaluate it, pictures never work with these real curvy cars. The Corvette has never been a nostalgia machine- it has always been a contemporary super car, which is what it needs to be. The 68 & 84 Vettes were huge departures from the previous model. It needs to be the American Ferrari/Aston/Maserati and I think this one is moving in that direction. 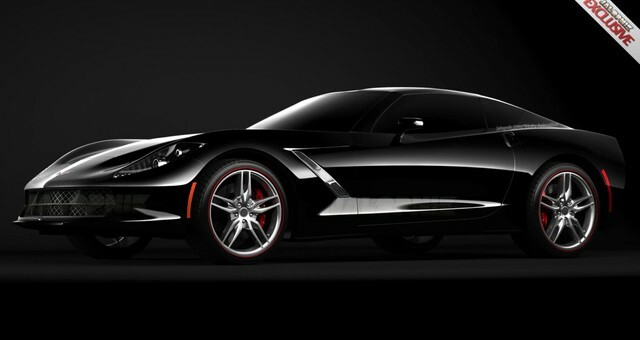 Don’t get too excited folks, this is not what the new corvette looks like. I was at the Chevy Conference in Las Vegas this week. The new car is amazing and it is worth the wait Think Supercar ! and is the rear-end actually camaro influenced? they get rid of the dome rear windshield? ahha…. I cannot comment specifically but I can tell you the car does NOT resemble the Camaro at all. It is exotic and will suprise a lot of people. There have been a lot of drawings and pictures on the internet lately that are just ideas from designers . Rest assured the new vehicle has been held tightlyunder wraps. All I can say is it’s amazing! Not what you expect.